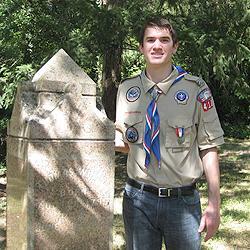 Eagle Scout Len Castro stands by kiosk he built to memorialize settlers. If you haven't yet joined the Society, you're missing out on a quarterly newsletter packed with interesting articles and photos related to Lakewood's past and present. There are seven early burial sites in the Lakewood region: Mountain View Cemetery, just off Steilacoom Boulevard, that marks its centennial in 2015, the pioneer cemetery on the grounds of Western State Hospital—a small area where early pioneers, such as Steilacoom’s first mayor (and Idaho’s Territorial Governor) William Wallace and his wife, Lucena, are buried; the Byrd Family Cemetery on the grounds of the South Puget Sound Urban Wildlife Interpretive Center, the Home of Peace Jewish Cemetery on Steilacoom Blvd SW, Western State Hospital’s patient cemetery in Ft. Steilacoom Park, and the Masonic Cemetery located at the intersection of Farwest Dr. SW and 120th St. SW. The fourth cemetery, parallel to Washington Blvd, known as the Old Settlers Cemetery, has been the location for the latest upkeep efforts. Two Lakewood-area Scouts made the cemetery the focus for their Eagle Scout projects; the latest work was done by Len Castro, who recently created a kiosk containing three steel plates engraved with names of those buried there. Len’s project is a continuation of the fence installation done by his older brother, Leavitt, several years ago. On July 31, Castro concluded his project. 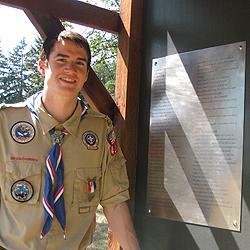 A member of Lakewood B. S. Troop 410, Castro estimated he has about 600 hours of time in the project. His Court of Honor was held on Feb. 14, 2014. Help with the project was provided by the City of Lakewood, Lowe’s, Home Depot, Gary Reese, and Russell Albright. “Working on this project has been a wonderful experience for me,” Len said. “I felt happy knowing that I was helping keep the memories of these people alive; building something lasting so their names can actually be seen by all who visit the cemetery and so they can be remembered. “Some of the information on the steel sheets are from headstones which are now gone, and people now, and in the future, will be able to have this information without having to do their own research. I took approximately five different sets of records, the work of people through the decades, who walked the cemetery and recorded the information from headstones, the first set beginning in the 1960’s. While the actual burial count may never be known, since part of the cemetery was paved over during the past century, Castro has listed 250 names on the plaques. Len has been home schooled; plans to go on a mission, and eventually attend college in Utah. An earlier account, done in 1999 by Cherie Peterson, said that the cemetery is “maintained by the county, and there appears to be no records of old burials, so walking the site is mandatory if looking for a particular stone.” According to her internet account, the land was donated in 1855 to Pierce County by Steilacoom attorney Frank Clark for use by early pioneers. “I suspect there are many stones lost due to years of trampling horses, etc., before the county took control and fenced it off,” Peterson wrote. The oldest grave, Castro said as he stood beside a granite obelisk (right), is that of “The Pioneer At Rest”, Thomas Wright b. 8-26-1795, d. 6-18-1868. Other burials include those of Lake City residents Mary Holt and her husband, Joseph Holt, who established the Holt Chapel, Lake City Community Church. There also are several members of the Bonney Family buried there, as well as several Civil War-era veterans. “The cemetery is still active,” Castro said, adding that the most recent burial was in 1992. Lakewood Historical Society recently installed one of its historical markers in the cemetery and plans a dedication ceremony next spring.